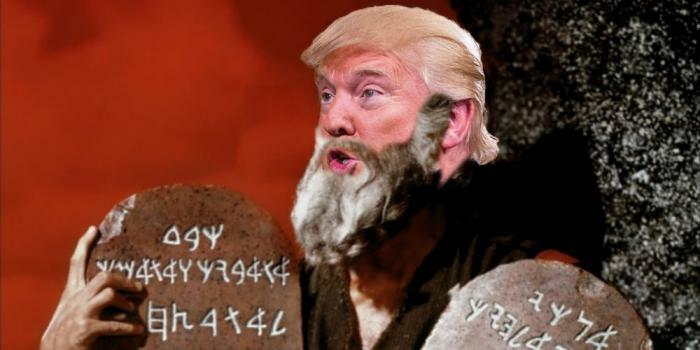 Businessman Donald Trump claimed to read the Holy Bible more often than anyone else, leading to widespread criticism and hilarious internet memes. Critics tear into Trump's claim that no one reads the Bible more often than he does (Facebook). LOS ANGELES, CA (Catholic Online) - On Tuesday, while criticizing the Iran Nuclear Deal, Trump commented that John Kerry "did not read 'The Art of the Deal,'" and that he "probably didn't read the Bible either." Take this quick St. Patrick's quiz! Trump's joke led to his claim that "Nobody reads the Bible more than me" - a statement that sent millions of critics into fits of laughter. Responses came immediately, with recollections of Trump's interview where he claimed the Bible was his favorite book, but then refused to share his favorite verse. His use of blanket statements and vague comments to shy away from directly answering a single question about the Holy Scriptures led several to believe the presidential hopeful had no idea what he was talking about. Following his Nevada caucus win, Trump commented, "I love evangelicals," swiftly followed by "I love the poorly educated." Tut tut, Mr. Trump. That wasn't very nice. How can the Republican candidate claim he loves evangelicals and that the Bible is his favorite book when he can't even properly pronounce 2 Corinthians? This image holds more water than Trump's claim. Other gaffes include a visit to a Mainline Protestant church, which supports gay marriage, and mistaking the communion plate for an offering plate. It is obvious Donald Trump is willing to lie his way to the top. He has stated, on numerous occasions, that evangelicals love him. If Donald Trump is willing to lie about reading the Bible and commanding righteous faith, what other falsehoods has the businessman been spreading? How could his stream of lies affect the United States should he be elected the next American President? Fear not. Despite three wins and 81 delegates under his belt, there is still hope for another candidate to overcome the falsely religious businessman. With any luck, Americans will wake up and understand that Donald Trump is not the man he claims to be and cannot be trusted to follow through with any of his promises. Donald Trump: presidential hopeful? More like presidential hopeless. ***NOTE: The opinions in this piece are those of the writer, not Catholic Online.